Mathematics: It’s a matter of life or death! As this week is History week in NSW, we thought we would flavour our blogs with a focus on history. The History Council of NSW’s theme is Life and Death. Possibly a slightly macabre theme for young children so I’ve highlighted these two ideas separately to showcase the connections between mathematics and history. If we take life to mean our journey of growth or the passage of time, then there are many connections to be made between the history and mathematics syllabuses. In the early years of primary school, we develop students’ understanding of time through their personal life events. Students learn to sequence daily events or events in their lives using images and words. We also introduce students to the use of a clock or timer to measure time and many K-2 mathematics classrooms spend time exploring length of time for example; How long does it take you to clean your teeth? What do we do after lunch? What time do you get up? How long does it take you to get to school? This focus on personal life and family history lends itself to an integrated unit combining outcomes from mathematics, history and English. In the early years there is a strong emphasis on the language of time. Understanding past, present, and future can be difficult for students to grasp as they are more abstract concepts. ACARA’s National Numeracy Learning Progression includes the sub element of Measuring Time, in the first two levels there is a focus on language prior to students developing an understanding and use of formal measures of time. View my resource focusing on time language It’s about Time! I have also listed some helpful resources below for time. As students move into upper primary, timelines may be introduced as a more mathematical model for displaying an event in your life or in the life of others, say a grandparent or historical Australian figures. The focus in the history syllabus is on sequencing the events, where students “sequence historical people and events (ACHHS098, ACHHS117)” as an historical skill in Stage 3. In the mathematics syllabus, the focus is more on the accuracy and spacing of the time between events. Students “determine a suitable scale and draw an accurate timeline using the scale”, this involves skills in division, proportional reasoning and fractions. Correct proportions in graphing and in timelines assists in the interpretation of data. This image was part of a tweet last week from the Sydney Morning Herald. You can see the importance of using scale in this image. 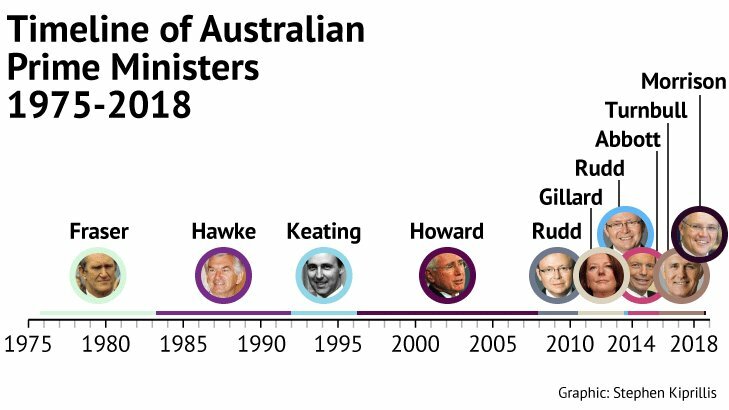 If the prime ministers were sequenced with no attention to scale, it may tell a different story. Students also have access to some wonderful online applications to assist in creating timelines, or infographics to display their historical data. For example, Piktochart, Venngage, Sutori, Office Timeline, MyHistro. (Note: you’ll need flash to view the videos, but the text versions are still available). Kay goes on to talk about some of the common misconceptions students have of decimals from the research she and Vicki Steinle undertook such as “longer-is-larger” or “shorter-is-larger”. They then developed a CD Rom resource for teachers (see link in resources below). Historically the decimal point has an interesting past that dates back to at least the 1500s. Amelia Williamson writes that “John Napier, a Scottish mathematician, appears to have been the first to intentionally use the period as a decimal separator” in her interesting article Period or Comma? Decimal Styles over Time and Place. In many European countries the decimal is represented by other mathematical symbols such as a comma. This is also the reason why in Australia, we use a space between tens of thousands and beyond, as using a comma may be confusing for those who use a comma as the decimal point. The history of numbers in general is also an interesting topic (and used to be an additional topic in our syllabus if I’m not mistaken!) If you have students in your class that have a passion for mathematics and want to know more, exploring other number systems and the history of numbers is fascinating. The story of One, a BBC documentary narrated by Terry Jones is interesting. If you don’t already subscribe to the Numberphile youtube channel or follow them on twitter @numberphile, you should. They have great videos you can use to engage and hook students into mathematics. Their video on Is Zero Even is great. Syllabuses such as the history syllabus provide real-world contexts for exploring mathematical concepts. Whether students are talking about their own present life “identify and sequence stages in their lifetime” (history syllabus Stage 1) or creating a timeline of the past “identify the original inhabitants of Australia and create a timeline indicating their longevity in Australia of more than 50,000 years” (history syllabus Stage 2), we need to be making connections to the mathematical skills and processes needed in creating and sharing these stories.